My publisher, Elephant's Bookshelf Press, has come out with not one, but two, summer anthologies. 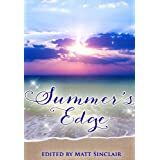 I love so many of the stories found within the pages of Summer's Edge and Summer's Double Edge. Let's see, there's a ghost or two, an angel, broken engagements and death...not to mention a few bad dates and mystical creatures. Per tradition, EBP provides an eclectic collection of quality short stories by writers of all genres and publishing experience. 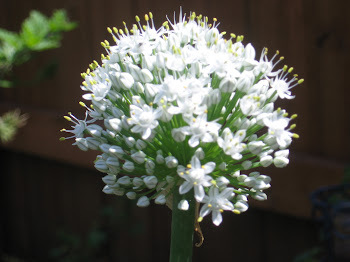 The joy is finding the gem that moves you. 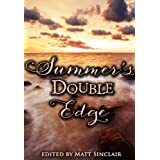 As you can imagine by the covers, Summer's Double Edge boasts darker stories than the lighter beach reads of Summer's Edge. This is where you will find my short, Skinwriter. The theme this season: the end of relationships. Yet don't be fooled. The end isn't always a bad thing. Especially since at the end of both books, you will find the first chapter of my debut novel, Whispering Minds! And lest I forget, I want to shout to the world how very much I adore my editor, Laura Carlson. Not only is she cute as a button, but she's whip-smart when it comes to catching typos and plot inconsistencies. I love working with her and the editorial team at Elephant's Bookshelf Press. Both anthologies are available digitally at Amazon and Smashwords with dead-tree copies to follow in a few days. PS: Congrats to my fellow writers for contributing such great stories: Robb Grindstaff, Simon P. Clark, Matt Sinclair, Shawn Proctor, R.S. Mellette, Amanda Hill, A.M. Supinger, Ken Staley, Tista Ray, Cat Woods, Samantha Enders, Julie Hutchings, Jennifer Prescott, MarcyKate Connolly, Mindy McGinnis, Michelle Hauk, Laura Carlson, P.S. Carillo, Jean Oram Jeff O'Handley, Tiffany Grindstead and Rick Pieters.